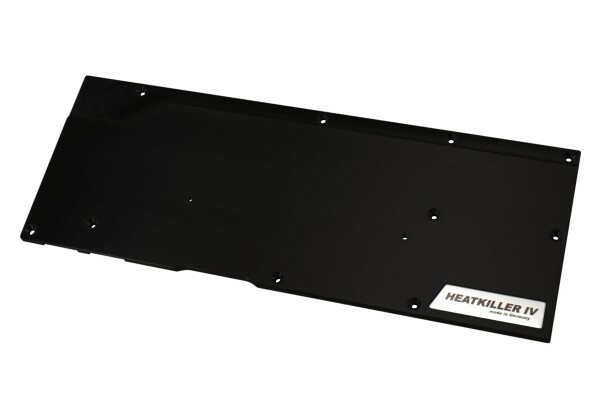 The HEATKILLER® IV eBC backplate is a useful addition for the HEATKILLER® IV VGA water blocks. Mounted on the backside of the graphic card, it improves the cooling performance while also granting mechanical stability. This is due to the construction out of massive black anodized aluminium. Even more, it also just looks good. The backplate cools relevant components on the PCB’s backside. These are GPU, memory blocks (VRAM) or voltage regulation (VRM). Precut thermal pads are included in the scope of delivery. Attention: For cooling the memory blocks which are present on the backside of GTX TITAN X cards separately sold thermal pads are available. Recesses in the backplate offer compatibility to mainboards with extremely wide IO ports. The stepping near the RAM slots offers ample distance to the memory modules. Isolating spacers on the backside of the backplate ensure easy installation. The enclosed mounting material is optimized for usage with HEATKILLER® IV water blocks. The backplate can be used with water blocks of other manufacturers. Specialized mounting material might be needed though. This is not part of the delivery scope. Kühlt diese Platte auch oder ist die nur zum draufschrauben und schön ansehen ? Die Backplate dient zur Stabilisation des PCB, wertet die Karte selbst allerdings auch optisch auf. Nein, leider nicht, das Layout ist abweichend. Bonjour, l'EVGA GTX 1070 SC Gaming ACX3 Black Edition à le pcb founder edition reference. Votre backplate est-elle bien compatible? This backplate is not compatible with your card. Es liegt alles dabei was man braucht, inklusive Wärmeleitpads. Hier wird nichts weiter benötigt. Es gibt keine 1070Ti mit einem Referenzdesign. Eine entsprechende Founders Edition wurde von nVidia nie vorgestellt oder produziert. Bestenfalls entspricht ihre 1070Ti dem FE Design der normalen 1080 da die 1070Ti eine kastrierte GTX 1080 Karte ist. Aber das müssen sie selbst prüfen.